Interview with Suzie Carr (Novelist). prolific novelist, philanthropist and avid blogger. 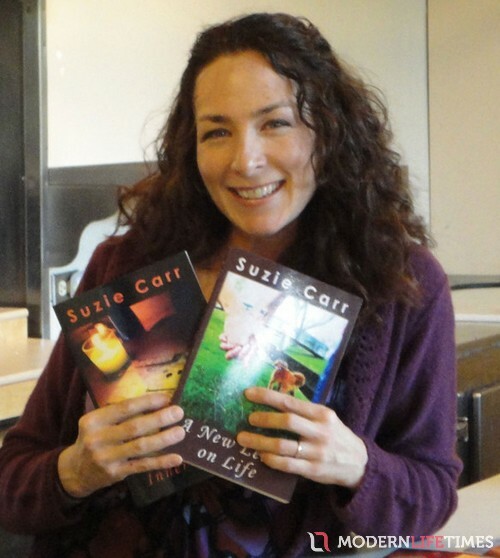 Today we are very excited to introduce Suzie Carr as mentioned on her site she is a prolific novelist, publishing company owner, philanthropist and avid blogger. Occasionally she sleeps, but not often. Whether it’s writing about love, inspiring new authors, advocating for lgbt equality and animal welfare or blogging about community awareness, positive living, taking action and inspiration. Suzie remains passionate in her beliefs! She believes that love is love and that love knows no gender. She also believes in the power of community and fostering a welcoming place where everyone feels connected and their voices are equal, valued and appreciated. It is an honor to have Suzie Carr dramatic fiction novelist or more well known as @girl_novelist on twitter doing this interview with me. Ask yourself, ‘did I do my best?’ If no, then go back & do your best. If yes, put anxiety aside and let the magic unfold on its own time. Q1: Tell me more about yourself, and why you have chosen to be a novelist? A little about me… Well, I admire the beauty of life’s curves and enjoy writing books about some of the most interesting ones. I’m big on personal development. I am all about focusing on what I want and not on those pesky annoyances that just get in the way. I rely on role models to keep me in line with my destiny, people like Tony Robbins, Les Brown, Napoleon Hill, Rhonda Byrne, just to name a few. My biggest motto in life is: To move forward, you need to shake things up and get out of your comfort zone. So, yes, I’m one of those over-achieving gals who just loves to look for ways to grow and stretch beyond what’s comfy. For instance, I wake up at 3 a.m. every morning to write. What motivates me is that joy of having words come alive as my fingers dance across the keyboard, and the way this tickles my core. I have a burning desire to write. It’s a rush and a healthy addiction. The process of inventing and escaping into my characters’ lives. I enjoy delving into their past and figuring out their flaws, their triumphs, their motives. These characters take me on a ride. They often take over the keyboard and send me reeling on journeys I didn’t even think of in the development stage. This process is fascinating to me. They come alive on my screen and what I planned to write, sometimes gets crossed out and rewritten by an outside force that is far greater than my own creativity. I can’t imagine a life without writing. Q2: How did you start your writing journey, and what difficulties did you face along the way? I’ve always crafted stories in my head, even as a child. I would make up scenarios and play them out. I would also read books, lots and lots of books and imagine ways I would change them to better suit the story. As a college student, my visit to bookstores became about pouring over book after book on how to write a novel. I studied the craft like I was studying for the bar exam. Finally, I attempted my first novel and it was terrible! I ran into writer’s block halfway through. But I didn’t give up. Instead I turned my focus to article writing. I wrote what I knew about, hairdressing. I published my first professional article with Dayspa magazine and framed my $300 check! I was published! The rush drove me on and I ventured into writing articles for a local animal organization dedicated to the welfare of domestic shelter animals. I volunteered these and loved the feeling of offering a service to better serve an underserved need in the community. I always knew that when I finally became a profitable writer, I would dedicate a certain portion of proceeds to an organization that served a great purpose. I am thankful to my readers for giving me the means to do just that. I donate a portion of monthly proceeds to Heart United for Animals. Energized with confidence, I once again tried my hand at writing a novel. I brainstormed a book about a girl coming to terms with her sexuality. That’s when The Fiche Room was born. I wrote that book back in 2003 and had it published in an online bookstore for years. Then, in 2011, I decided to open up my own publishing company, hire a team consisting of an editor, proofreader, and beta readers, and have since published eight other novels, all bestsellers on Amazon Kindle. Q3: Tell us more about your Free Writer’s Video Course and what service this offers? It is for aspiring writers and offers tips on how to get started as a writer. The series consists of twenty short videos that will hopefully inspire and help aspiring writers on their writing journey. The videos address some frequently asked questions most aspiring writers have, as well as some questions that they may not be thinking of, but that are critical to understanding to be successful in this competitive industry. People can sign up by visiting AuthorInsightsbySuzie.com. Q4: Do you have any tips on how to become successful as a writer? Read. Read. Read. Read the good and the bad. Lessons are in both. Additionally, write. Write every day, even if for five minutes. Connect with other writers. Join networks. Interact. Follow their blogs. Write a blog of your own. Surround yourself with people who will challenge your ideas and offer helpful critique that will build you up as a writer. Also, I recommend joining a book club. Get heavily involved. Read and discuss. Your best ideas and lessons will come from these meetings. Lastly, enjoy the process. This is the only true path to success. You must LOVE the art of writing because it can be tough. Write for the love of it, and good things will surely follow. Q5: What projects are you working on now? I am narrating my novels and turning them into audio books. It’s been quite a learning curve in terms of meeting the standards of Audible.com, the leader in audio book distribution. I’ve had to learn how to set up a home recording studio, how to narrate, and how to edit and master audio files. It’s a time consuming process, but one that is rich in complexity and enjoyment. Additionally, I am writing a how-to book called Writer’s Insights that is based on my Writer’s Insights Video Series. I am expanding on the topics I presented in the video series and adding new information. And finally, I just started storyboarding my next novel, Sandcastles. This book will be a dramatic fiction novel with a twist of romance. Thanks Suzie for your wonderful insights and doing interview. Hope you all enjoyed this interview you can connect with Suzie Carr by visiting her website. Your welcome and it’s my pleasure to interview. Thanks for sharing your great tips.